We are doing something a little different this month. 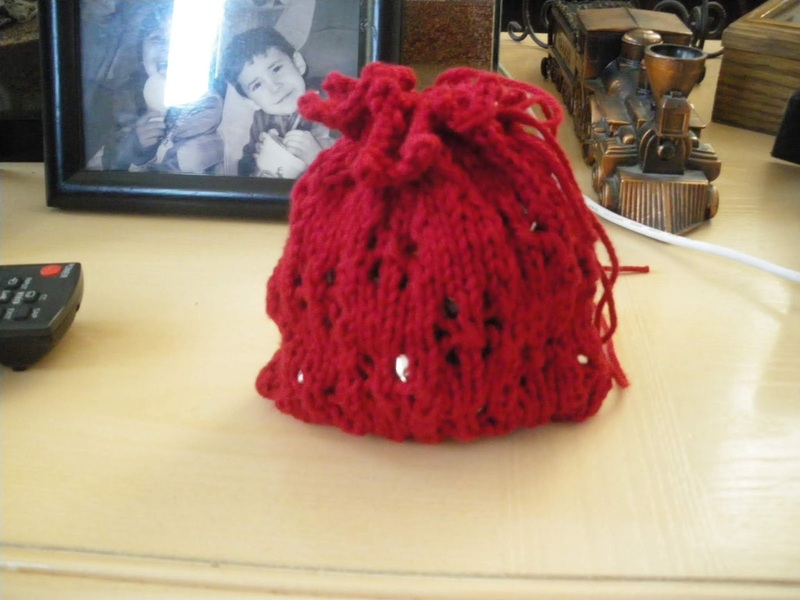 I wanted to give you a chance to knit something that could be used as a gift bag for Christmas for either candies, or lavender or whatever you would want to share with someone. If you fill it with lavender or other scents you can place in a drawer, if you decide to use for candy it works great, I put Hershey Mini Candy Bars in mine. You can also line it if you like. I didn’t go the lining route, but it is up to how you want to finish it. 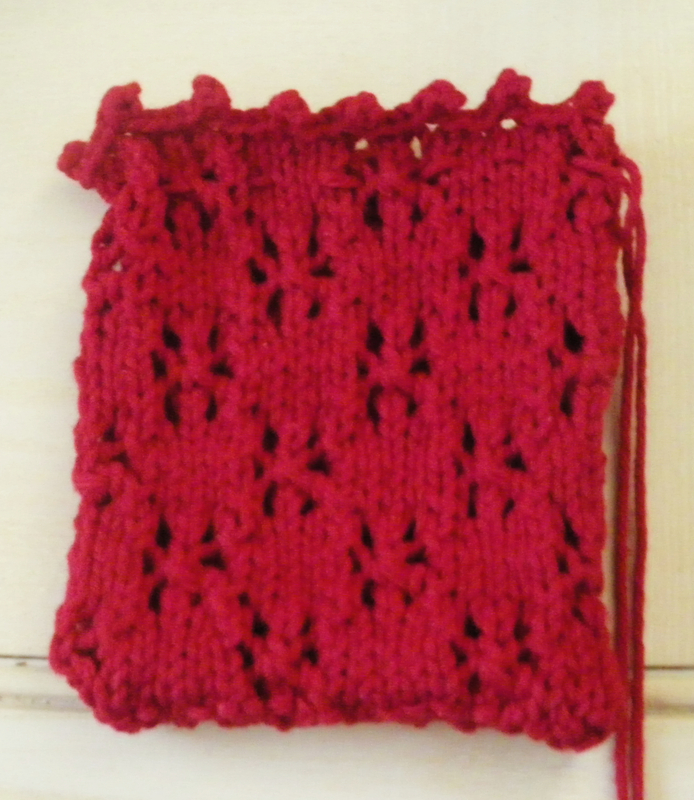 If you prefer to do this as a cloth, just cast on 37 and work as the pattern is stated OR cast on 45 and use 8 stitches for the border, 4 stitches on each side. The two photos below are as follows: one is of the completed bag and the other shows what it looks like when filled. 1 skein cotton yarn, I used red, #5 US Knitting Needles. Notes: SSK=Slip 1, Slip 1, K2tog; K2Tog=knit 2 stitches together. The instructions for SL2, K1, P2SSO are just like the S1 1, K1, PSSO you are just doing it with two stitches instead. I past my stitches over one at a time. Row 1: (RS) K1, *K3, SSK, YO, K1, YO, K2Tog; repeat from * to last 4: K4. Row 3: K1, *K4, YO, SL 2, K1, P2SSO, YO, K1; repeat from * to last 4: K4. Row 5: K1, *K3, SSK, YO, K1, YO, K2Tog; repeat from * to last 4: K4. Row 7: SSK, *YO, K1, YO, K2Tog, K3, SSK; repeat from * to last 3: YO, K1, YO, K2Tog. Row 9: K1, *YO, SL 2, K1, P2SSO, YO, K5; repeat from * to last 4: YO, SL 2, K1, P2SSO, YO, K1. Row 11: SSK, *YO, K1, YO, K2Tog, K3, SSK; repeat from * to last 3: YO, K1, YO, K2tog. Repeat the above 12 rows for pattern. I repeated the 12 rows 2 more times. For larger bag, repeat the 12 row set 2 more times and you can enlarge by adding more stitches to cast on in increments of 8 stitches. Finish: I finished off by doing a Picot Bind off after completing the repeat rows 1-12 (make sure to end with a Purl row). Next row: Bind off 2 stitches, * slip that stitch back to left hand needle, cast on 2 stitches using cable cast on method. This cable cast on can be found by googling the term if you are not familiar with it. Now bind off 5 sts; repeat from * to end. Cut yarn and draw yarn through last stitch on needle. To complete, fold in half (wrong sides together) join sides and bottom. Thread ribbon or yarn through holes in lace, pull and secure after filling the bag. I put Hershey mini bars in my bag.